Black Rock City: Burning Man is not that different from everyday life. You get up, get dressed and catch the bus to work. You get off work and have a beer with some friends at a bar. And then you take off your pants, put on animal face paint, climb a steel tower to stare at a massive fire, and run screaming into the night with a hundred strangers you will never meet again. Life in Black Rock City is just like life in any other city, except when it’s different. A lot of fuss is made over the ways in which this massive temporary city of 60,000, which sets up in the Black Rock desert of Nevada for one week every August, differs from the rest of the world. The idiosyncrasies are what sell the event, why people pack up trucks full of paint, wood and glitter and spend hundreds of dollars every year to vacation from the straight world of capitalism, clothing and jobs. 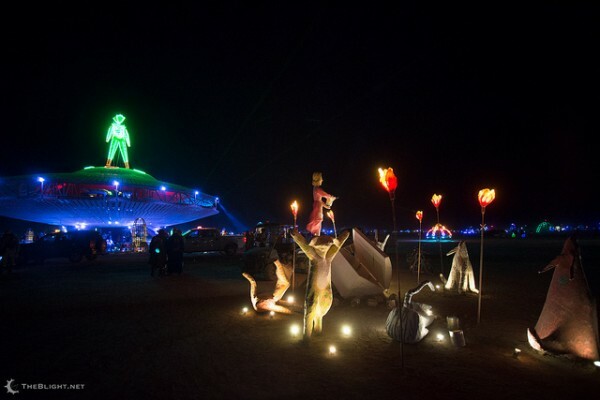 But what happens at Burning Man really isn’t alien at all. There are enough precariat individuals living outsider existences, experimenting with strange philosophies of life and organization in the U.S. — certainly more than enough for 10 Burning Mans. There is an art district in nearly every American city, with painted statues, cars and buildings giving a individualist spirit to that urban area in mythos, if not in actuality. “Keep _____ Weird” could be a bumper sticker almost anywhere, and the creative classes that support this idealism come from every state of the nation. Maybe you consider yourself one of them. The fact is, the denizens of Black Rock City do not spring fully formed from the alkali flats. The massive building projects and artwork that go on in this “temporary” city require an entire year of preparation in the midsts of everyday, long-term cities. The minute that the temple burns to mark the end of the festival, planning and preparations begin for the next year. Burning Man has a fully-staffed EMT team, a fire department and a police force. It has a power grid and public sewage facilities for the entire population. This city, like any other, is not a Temporary Autonomous Zone of spontaneous existence. No matter how awe-inspiring and life-changing festival goers might find it, there is no immaculate conception in this desert. Of course, you don’t think of this while dancing on the third story of a giant luminescent snail, slowly crawling across the dust-swept desert night, one of hundreds of similarly impressive creations flitting about the city like fish across a reef. You don’t think about it when you are building wooden structures in the incredible heat, naked to the waist (or all the way), relying on the kindness and care of others to ensure you don’t work yourself into hyperthermia. And you don’t think about it when planning all year round, scheming great schemes with your friends and coworkers about the things you could bring to the desert next year, regardless of difficulty and expense. Perhaps it is that there must be a great event — an exposition of sorts — for this sort of distributed, year-round creativity, individuality and experimentation to exist. Without Burning Man, perhaps you would still attend large bonfires, and ride art cars sprung from the wilds of human imagination. But when would you see more than one or two in the same place? You might take part in wholesale interactive art experiments, but would you decide to build your own survival infrastructure only to take it apart several days later? Weirdness and creation need performance, otherwise they largely remain wishful thinking. There is a reason that Burning Man attendees make up just a small part of other cities. It is because every performance needs a stage, whether that stage is a street corner, storefront, front yard or 25 square miles of desert. In costume and with tools in hand, the people of Black Rock City have stepped away from the crowd for a performance that will spring many others in other cities that are not known for their differences, but have them all the same. Gordon, care to add any of your own observations or experiences here?